“No surprise,” was the reaction when I ran the rumor past a fashion editor friend of mine last week. I agree. Besides not doing much for the house design or sales-wise, he is horribly unreliable. I had my own experience first hand when he stood me up for an interview for Newsweek back on a Sunday afternoon in June, 2007—after weeks of rescheduling it by his people and four days before my several-page-long story was due. I was told he didn’t show up was because he was too busy doing fittings. The real reason? He was attending parties at the Venice Biennale. After three more days of the press office promising me they would make the interview happen, he blew me off entirely. I begged the Gucci Group brass to produce Frida Giannini of Gucci as a replacement, and kindly and quickly they did. While I was writing the piece at record speed, a gigantic bouquet of roses arrived from Pilati with a note, not apologizing, mind you, but simply explaining he had missed our rendez-vous due to a “contretemps.” I wanted to send the flowers back, but was too busy writing to deal with it, much less get them in water. Once the piece was published, I sent Pilati a note saying I enjoyed seeing photos of him in Women’s Wear Daily at his “contretemps” and that it was too bad we’d never officially meet since I decided never to put myself in the position of getting stood up by him again. I have not written about Pilati or Yves Saint Laurent Rive Gauche since then. Until today. behavior was excused, even coddled—particularly at Yves Saint Laurent. The only other designer who didn’t show up for an interview with me in my 25 years of covering fashion was Yves Saint Laurent himself: he slipped out the back door of his office at 5, avenue Marceau rather than meet with me. What is it with that house?? But these days, luxury brands are run by executives who want to make money and doing things like alienating the mainstream press and making clothes that don’t sell aren’t seen as charming, eccentric or avant-garde anymore. Business is business. Which makes the industry talk that Olivier Theyskens—who was sacked from both Rochas and Nina Ricci for producing complicated clothes that don’t sell—is a leading candidate for the Saint Laurent gig an extremely puzzling thought. Doesn’t YSL CEO Valerie Hermann have Google? 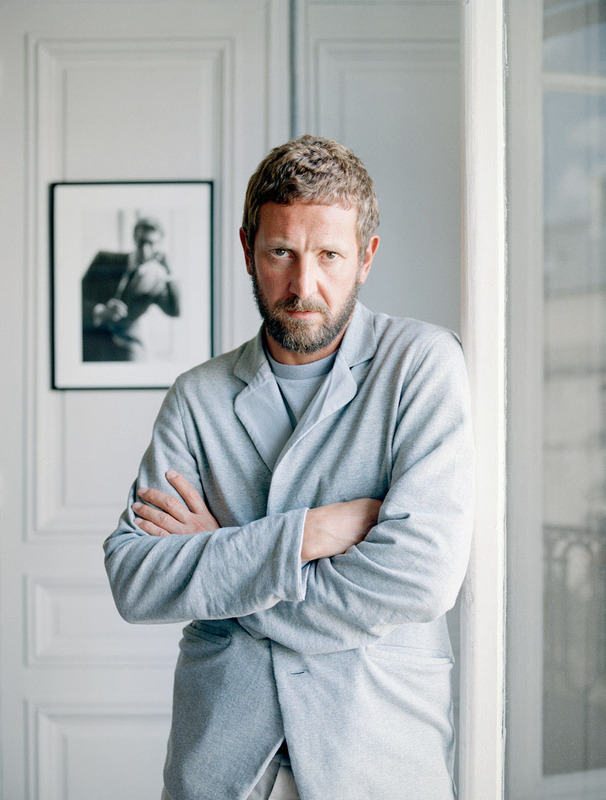 * Hint magazine is now reporting that Pilati has just signed a new three-year contract at Saint Laurent, after Raf Simons, designer for Jil Sander, and Hedi Slimane, the ever eccentric Frenchman who once designed the Saint Laurent men’s wear line, turned down the job. That should give Hermann plenty of time to find just the right person to replace Pilati. The show, set in a mammoth black and white jardin à la française with working fountains—which Lagerfeld said was inspired by Alain Resnais’ 1961 film Last Year in Marienbad —was a panopoly of ideas and eras run through Lagerfeld’s Chanel blender. For day, there were tweed suits with baby doll mini-dresses, micro shorts, A-line skirts and pencil skirts, in soft natural tones such as slate blue, dusty rose or goldenrod and occasionally flecked with sparkling crystals. For night, the dominate line was trapeze with an empire waist made of airy fabrics such as tulle and lace and decorated with feathers. (The trapeze, by the way, was invented by Lagerfeld’s archrival Yves Saint Laurent at Christian Dior in 1958). The overall look was light and feminine—except for the footwear, which was mostly wedge-heeled combat-like boots that gave a Bride of Frankenstein air to it all. De la Fressange received an ovation when she stepped out onto the soft white pea-gravel runway and strolled through the gardens in her signature slouch to an orchestra playing The Verve’s “Bittersweet Symphony.” Besides walking in the show, de la Fressange will be featured, along with 1990s British model Stella Tennant and Danish newcomer Freja Beha Erichsen, in Chanel’s spring-summer advertising campaign, which Lagerfeld will shoot in the South of France. As de la Fressange smiled to the crowd, it was obvious she was pleased to be back at the house of Chanel. Is Lagerfeld’s Reign at Chanel Coming to an End? Designer Ralph Lauren, arbiter of American classics, is looking to conquer Europe and Asia. How? With Uncle-Sam-style amenities. The designer, at center, celebrates the April 14 opening of his Paris flagship with his family. Alexander McQueen at the opening of his first boutique in London in 1999. Photo by Tim Jenkins. The son of a London cabbie became a designer phenom before taking his own life. A look back at his life and legacy. The first time I met Alexander McQueen, who committed suicide Thursday in London at the age of 40, he was sitting at his desk at Givenchy, days before his debut show for the legendary French couture house. He was 27 years old, having made a name for himself in a few short years after his graduation from Central Saint Martins in London by staging outlandish shows filled with really smart clothes. I was about to interview him for a cover story for NEWSWEEK, and minutes before the shoot, he decided to jazz things up a bit and shaved himself a mohawk. There were bits of hair all over the white Formica desk where the ever-elegant Hubert de Givenchy himself used to work. How the House of Versace went from rags to riches—and back again. Donatella Versace, tiny, sculpted and forever blonde, was standing backstage after her menswear show at the Teatro Versace in Milan in June, receiving polite congratulations from a handful of editors and friends. The scene was positively dead compared with Versace shows a decade ago: no celebrities posing with Donatella for paparazzi, no bodyguards holding back the throngs, and no pals swilling champagne. Donatella’s brother Santo, in his usual charcoal suit with black turtleneck, came back for a few minutes to shake some hands. Her husband, American-born Paul Beck, tall and tan, stood alone in the corner; no one even noticed him. It all felt feeble, pathetic—a sad, soulless charade to promote something that no longer exists. Can someone tell Harvey Weinstein that if he wants to run a fashion company, he should read WWD instead of Variety? There’s talk that Halston, the brand Weinstein owns with a bunch of bankers, may hire Olivier Theyskens as its new creative director—he who managed to kill Rochas’ fashion line and put Nina Ricci on life support. While Theyskens may be a talented costume designer who can whip up crazy fantasies for actresses to wear on the red carpet, the 31-year-old Belgian has proven repeatedly that he is incapable of creating clothes that women who pay actually want to buy. And in this economy, with the fashion trades announcing company bankruptcies and closures almost daily, trying to sell might be a good idea. Yet, WWD is reporting that Vogue Editor Anna Wintour wants to find Theyskens a new house to take down—guess she likes those red carpet fantasies in her magazine too. Schiaparelli–the 1930s French house sked to relaunch next year—apparently talked to him. And Weinstein, who is friendly with Wintour, and his partners are said to be listening to her and inexplicably considering offering Theyskens the Halston job. Proof again that private equity should not be in the fashion business…. There’s loads of whimsy and humor in her designs, such as little crystal butterfly pendants studded with tiny spinels in bright colors or smoky drop crystal earrings flecked with little brushed-gold hearts. My favorite: a one-of-a-kind giant quartz bangle studded with pale sapphires, which runs $12,000 and weighs a ton. Are you listening, Santa?